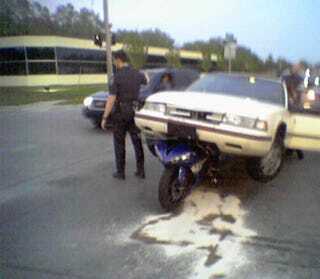 I was nearly rear-ended this morning while on my motorcycle, and that’s a really scary feeling. I came to a stop at a light and a couple seconds later I heard the person behind me lock’m up...thankfully they skidded to a stop in time. Once the adrenaline blip subsided and the smell of burning rubber passed, the first thing I experienced was anger. How the hell could this person have not seen me? I have lights and wear a ridiculously bright, highlighter-yellow jacket. Then I remembered a TV show I was binging on over the weekend called Brain Games, and one episode was about multi-tasking (something humans are very bad at, regardless of what they think), and how people simply don’t see the things they’re not looking for. They even used motorcycles as an example - people in cars don’t see motorcycles because A) the human brain can only focus on one task at a time, and B) they’re just not looking for motorcycles. Those stickers and signs that read “Watch out for motorcycles” aren’t suggestions or hyperbole; there is actual science behind the message. When you’re driving a car you need to actively add motorcycles to your mental watch list, or you’ll likely end up driving into one.